I have a secret love for creating Fandom workouts. So last week, in a casual passing tone, Erin Martin said it would be fun to do a Disney workout. Yes. Yes it would! So I created one. It was a fairly easy workout. I mean, we exercise in the elephant basement for crying out loud. I made our medicine wall balls out of recycled basketballs and duct tape. And Dumbbells out of kitty litter containers. We’re pretty basic. But we come together every week and chat and workout! And some of the girls have started going to a gym to workout more. In fact, I received a compliment from Alyssa Borek‘s trainer who told her her squat form was terrific. And she credited me for that. I loved hearing about you and Kim Szawan telling your trainers about Bootcamp and them asking you where and you’re like, um, the elephant basement. It’s the cool new club where all the cool kids workout, don’t you know?! But I love how Monday nights are Zoo Bootcamp night. 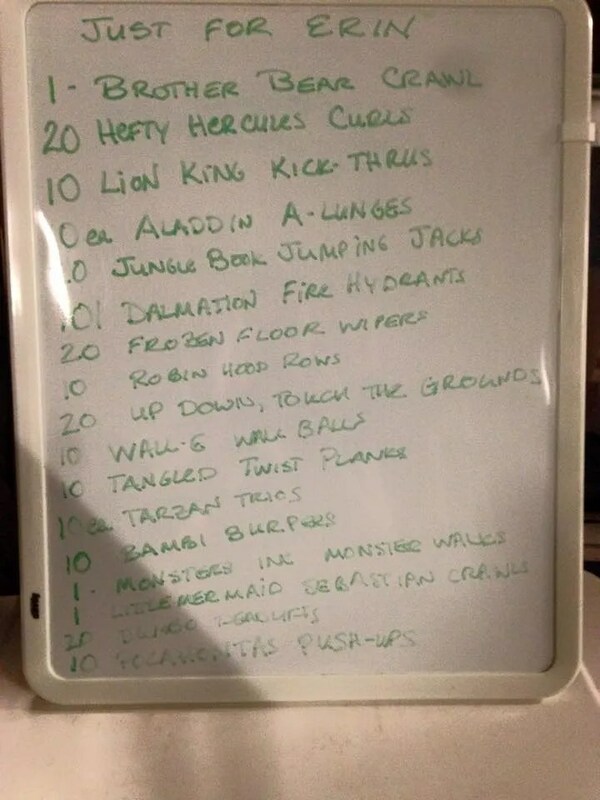 And Erin wanted a Disney workout. So by gosh, she got one! I think I’ll try to create a Disney villain workout. Double Ursula unders. Gaston goblet squats. I’ll definitely create a Doctor Who workout, for Susan Burchardt. AndStephanie Forbes Miller wants me to create a Monty Python. I’ve got some work to do! Haha! Great work, ladies! Keep coming back. It works if you work it.